Happy Tuesday Stretch !! Cal here this week talking stretch glass. If someone –anyone – had told me when we started doing this that we would still be find new and exciting stretch glass to write about, I might have been skeptical. But here we are. I’ve long ago lost count of what episode we are on; I know I speak for Dave and Russell in saying that we are all very happy to see the continuing interest in stretch glass among all of you and a growing number of collectors. Tonight theme is “size matters” in stretch glass just as it does in many other aspects of our lives. Large stretch glass can be very beautiful and really make a statement when it is displayed in a proper setting. It can also be quite useful on certain occasions. Not all the stretch glass companies made big items, so we have a limited number of items to consider. When I say big, what immediately comes to mind? Punch bowls, right? That’s what I think of. Diamond and Fenton made the largest of the punch bowls, so tonight I’ll focus on them. They also happen to be among the largest items made in stretch glass. In some aspects, these punch bowls look almost identical and in others they are very unique in shape. Let’s take a look at the Diamond and Fenton punch bowls which look like they are the same. 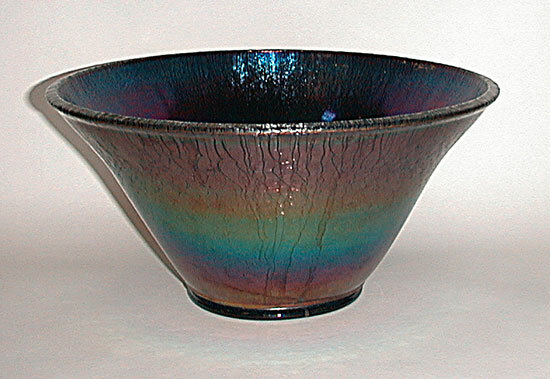 The significant difference is in the base of the bowl and, in some cases, in the color of the glass and iridescence. Here is the Diamond base (Topaz) photo and the Fenton base (red) photo. 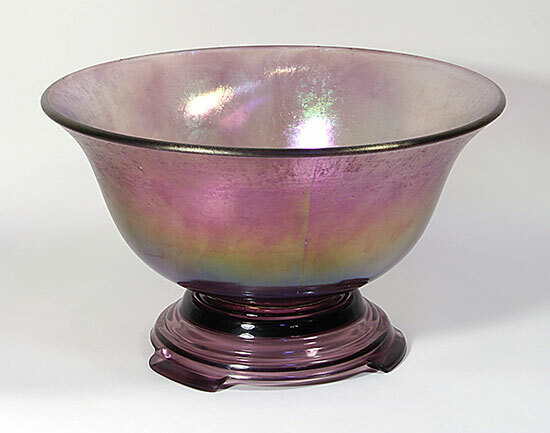 The flared punch bowl by Fenton is 12“ wide, 5 5/8” tall and the base is 4” in diameter; it is known in Persian Pearl, Florentine Green, Wistaria, Celeste Blue, Ruby and Grecian Gold. The Florentine Green, Celeste Blue and Ruby ones are found more easily (I didn’t say they are easily found) with Persian Pearl being next most likely. I have a light Wistaria bowl and a Grecian Gold one and am not aware of any others, although I suspect others exist; as pictured, sometimes the Persian Pearl bowl is found decorated. You will note that the list of known colors does not include Velva Rose, Tangerine or Topaz. I have a Topaz punch bowl which we believed to be from Fenton until we tried to put it on a Fenton base and it did not fit (more on that later). The Grecian Gold one came from Frank’s closet at Fenton and Tom Burns found the ‘light’ Wistaria one for me a number of years ago. 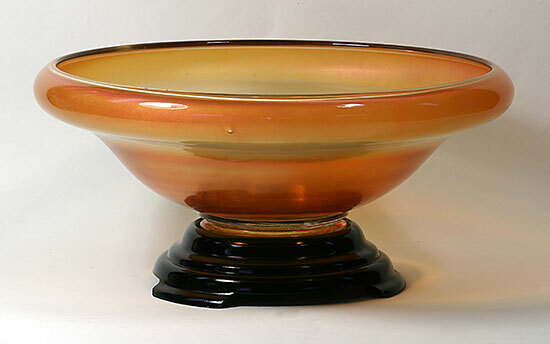 These punch bowls will fit on a large Fenton black base, which is not overly difficult to find. 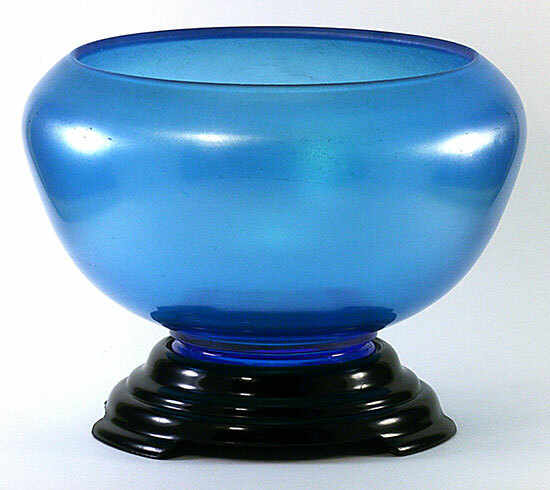 Fenton also made pedestal bases in stretch glass to match the bowls. I have 2 Ruby bases and a Florentine Green one. I am aware of a Celeste Blue base and there may be others. 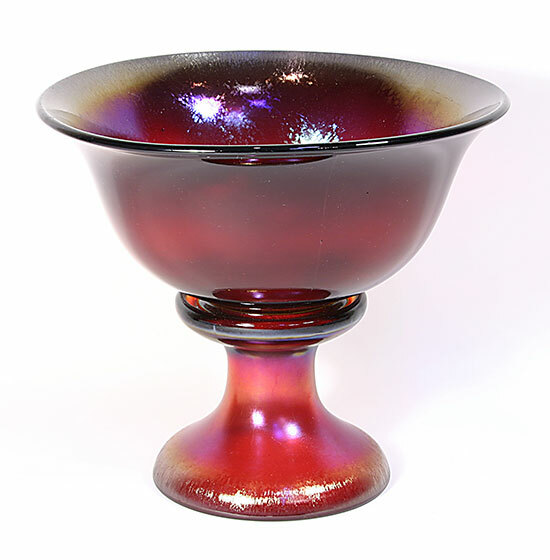 Any of these are considered hard to find, although in the last 10 years a number of the Ruby pedestal bases have come to market, so they are not considered rare as was the case when the first couple were found. 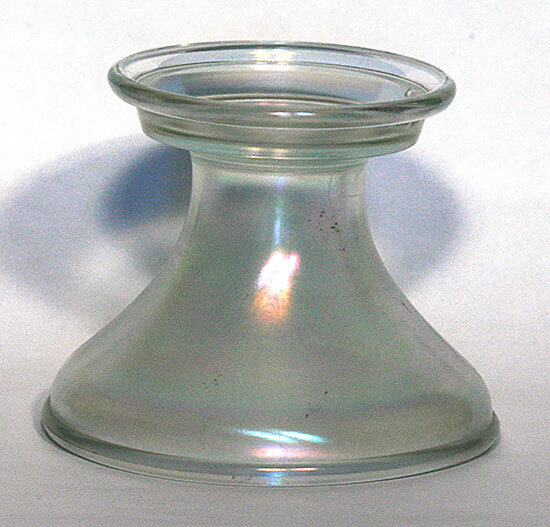 When you put a punch bowl on a pedestal base, it will be approximately 10 1/2″ tall, quite a commanding piece of glass. 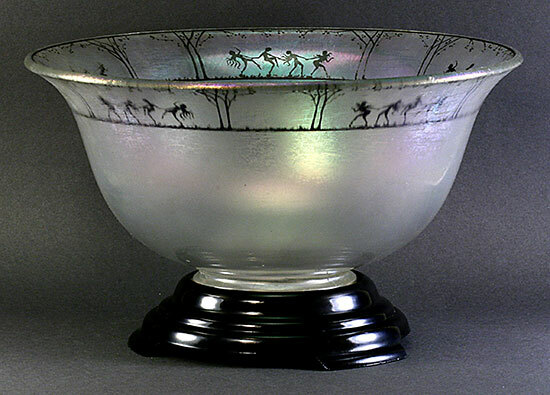 The Fenton punch bowl was made from mould #604. Fenton finished pieces from this mould in at least 6 shapes. There is the flared punch bowl and a similar crimped punch bowl. Next in size would be the Aquarium bowl. Then there is the flared, then cupped console bowl. …and made a flip bowl with the sides turned down. And finally they flattened it out into a 17” diameter plate. Not all shapes are known in all colors, but all shapes are known to exist in Ruby. 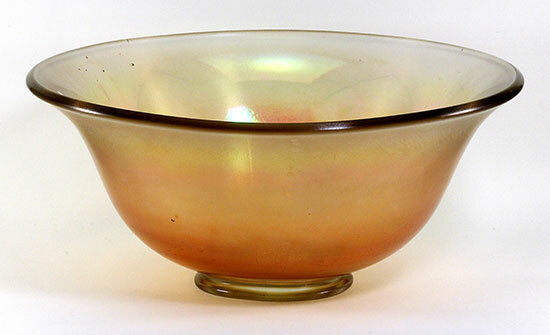 The flip bowl is known in Topaz (as you can see), so we know they used Topaz glass in the #604 mould. There is a bit of mystery as to why they didn’t make some flared punch bowls, or if they did make a turn of them, where they all went. 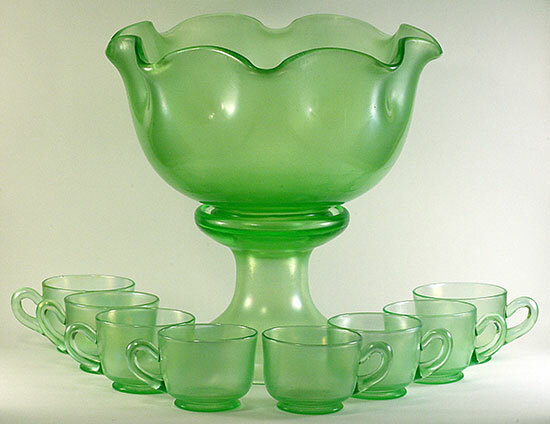 Fenton also made punch bowls during the “Later Period,” as I am now referring to the revival of stretch glass from the 1970s until 2011. These bowls are a new shape and have a pattern. They are quite beautiful and were sold as a set with a pedestal base and 12 punch cups. As I mentioned, Diamond made a similar bowl which fits on a Diamond black base. 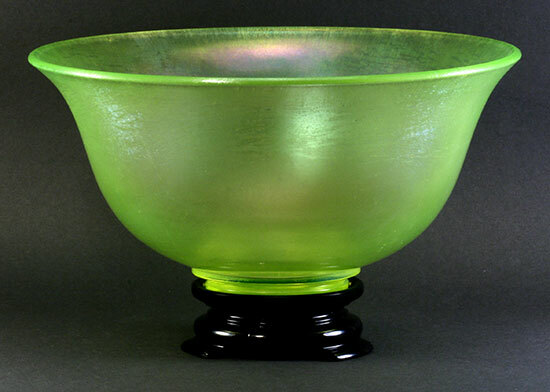 Diamond also made stretch glass bases for their bowls, but again, these are hard to find and are considered rare. …as well as one in Royal Lustre (cobalt with a shiny silvery finish) and a Marigold one. The Marigold one has an unusual treatment at the top of the bowl, causing some to suggest that it is a fish bowl. 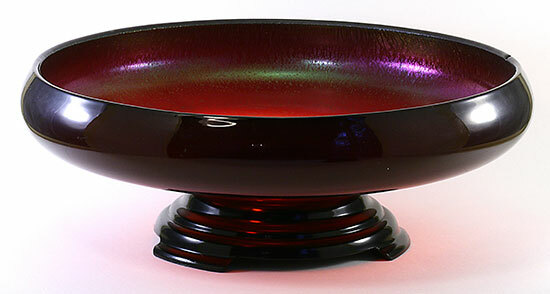 It has a matching iridized pedestal base. I suspect that some gold fish would be right at home in it, but not while it is in our house. I believe it is more akin to the bowl for a bedroom bowl and pitcher set, but it is generally referred to as a punch bowl. There are only 2 of these known, one in crystal and the other in Cobalt Blue. If you have one in any color we would love to see it. 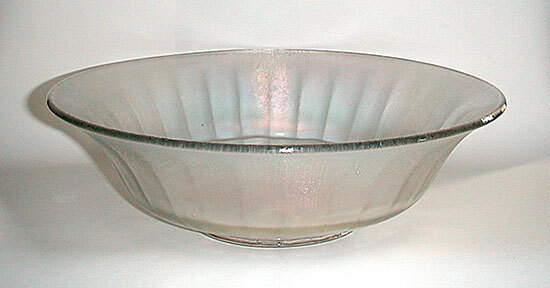 It is an interesting piece of stretch glass to use, which I do when I need a bowl for a giant salad on a buffet table. It holds enough salad for a lot of folks since it is nearly 16” wide and over 5″ deep. 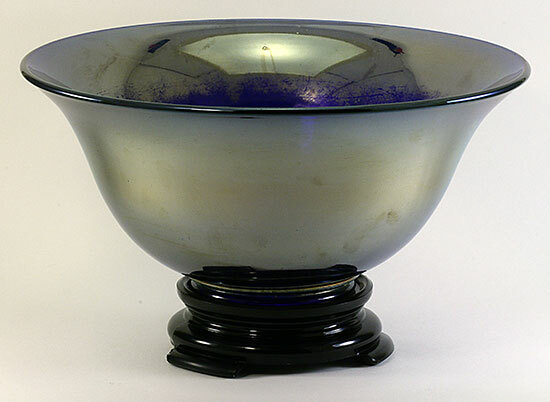 The third style punch bowl made by Diamond has nearly straight angular sides. 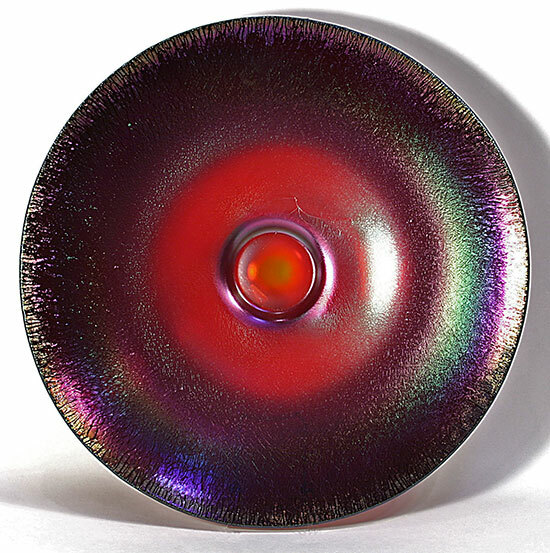 This bowl is known in Egyptian Lustre and in other colors and measures 12” wide and 6” high with a 5” base. The Egyptian Lustre one I have was purchased from Berry Wiggins, who many of you may remember as an early researcher in stretch glass. The iridescence is wonderful both inside and outside. We have previously talked about punch cups, so I won’t get into that topic tonight. There are other large pieces of stretch glass and I will write about some of them another time. 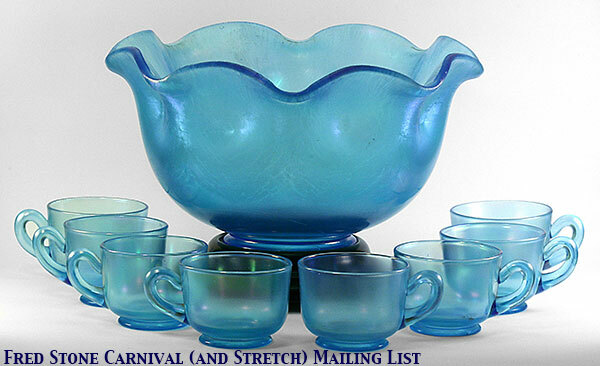 For now, I hope this is sufficient to whet your appetite to go looking for a stretch glass punch bowl. Don’t forget our Annual Convention coming up July 26-28 in Marietta. Come see us; we will welcome you with open arms and show you some amazing stretch glass.